Composite Adhesives Market size surpassed over USD 1.4 billion in 2016 and consumption might exceed 850 kilo tons by 2024. Construction composites demand registered an annual growth rate of over 6%. Growing popularity for FRP bathtubs, windows, doors and panels in buildings should drive global composite adhesives market size by 2024. U.S. housing industry had constructed over 1 million units of homes in 2015 owing to ease of lending standards, low mortgage rates, slow house price inflation and increasing employment. Increasing funding support from state and local construction organization and agencies should further bolster product demand. Modern aircrafts are built utilizing over 50% composite material content to reduce weight, emissions and improve fuel efficiency & performance. Major OEM’s in aerospace industry including Bombardier, Airbus and Boeing are strategizing robust plans to increase production rate. Boeing expects an increase of over 6% in annual commercial aircraft deliveries reaching over 770 units in 2016 thus driving global composite adhesive market demand. Global adhesives & sealants market size exceed USD 30 billion in 2016 and should witness gains at over 5%. Composite bonding of like and unlike materials without using fasteners enables manufacturers to eliminate drilling hole and leverage cascading benefits of cost & weight savings throughout assembled structures. It significantly shortens production time, cycle and cost. Replacing fasteners with adhesive also deliver better fatigue performance resulting in rapid and long-term growth in the development of structural sealant market size. New World Doors an Irish door manufacturing company reduced its production cycle time by 70% for its inner sash door bonding step by using methyl methacrylate (MMA) composite adhesive when applied through an automated dispensing machine. Selection of a composite adhesives for any given situation is necessarily based on its versatility and frequent overlapping usage. The adhesive selecting process is arduous due to absence of a universal adhesive applicable to every substrate and availability for variety of options like epoxy, polyurethane, MMA, cyanoacrylates, acrylics, phenolics, polyimides and silicones. They are selected based on type & nature of substrate, cure & adhesive application method and stresses the joints will face during service. Mechanical action & characteristics, cost & flexibility also plays an important factor in adhesive selection process. 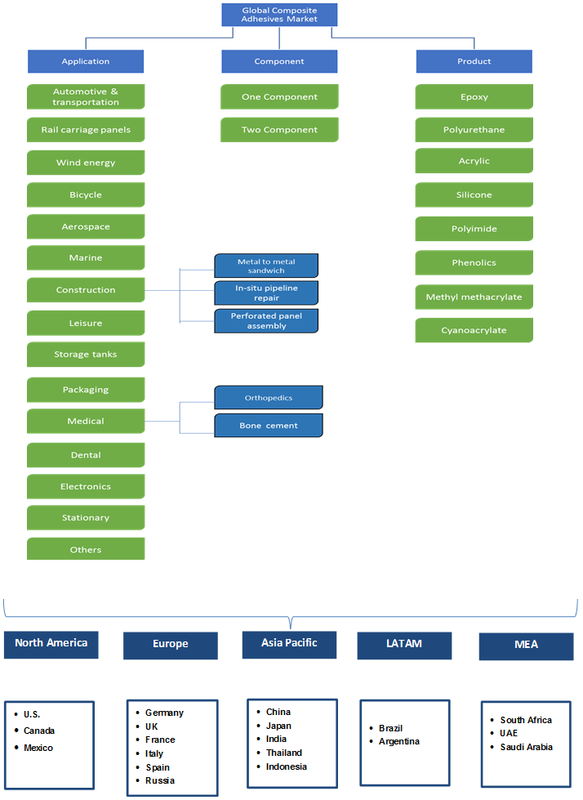 Stringent regulatory regimes in Europe and North America relating to emission control and limiting use of VOC restricted though policies by EPA regarding Clean Air Act might hamper composite assembly market size. Key raw materials for manufacturing these composite adhesives include matrix resins and fiber composites, which may face volatile pricing in the market along with procurement risk caused by demand & supply fluctuations might hamper composite adhesives industry growth. One component composite adhesives market size should witness gains at over 5.3% during projected period. These products do not require mixing & simplifies processing, while being available in paste, liquid and solid forms. One-part adhesive compounds usually require UV light cure, thermal curing and dual curing systems to meet demand specifications. They are designed to eliminate waste, improve productivity along with alleviating mix ratio, working life, weight and shelf life concerns. Epoxy, PU and acrylic structural adhesives are widely used one-part compounds. Two-part composite adhesives market size will grow significantly by 2024 owing to strong application scope in construction, aerospace, marine and automotive industry. They are also known as reactive sealants and are characterized by its ability to self-cure due to its chemical reaction. These structural adhesives are preferred solution for application demanding very high strength from coated, painted, bare or pre-treated metals and composite materials like glass reinforced plastics hence propelling industry size. Composite adhesives market size from epoxy-based compounds should grow at over 5.5% during forecast timeframe pertaining to its large quantity demand from automotive, aerospace and marine industry. Epoxy based compounds are widely popular which can be attributed to its high strength and temperature resistance, relatively low cure temperatures, ease of application, low shrinkage and low cost. 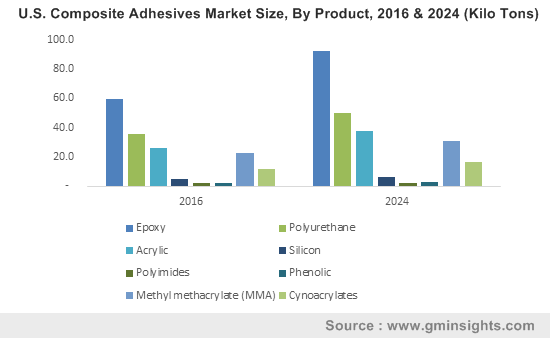 Composite adhesives market size from methyl methacrylate (MMA) compounds should generate revenue surpassing USD 360 million by 2024. This growth in product demand can be attributed to its unique property of being able to cure fully and reach full strength at room temperature. MMA excel in bonding metals like stainless steel & aluminum, thermostat composites and thermoplastics. These products also require less surface preparation to obtain optimal bonding along with offering durability, reduced weight, corrosion free, better aesthetics and even distribution of stress over bonded surface. One-part composite adhesives market size from aerospace application should witness very high gains at over 6% by 2024 owing to growing demand for commercial aircraft in countries like India, China and Brazil. Growing consumer expectations along with progressing air travel demand driven by wealth creation in Asia Pacific and Middle East region should drive commercial aircraft manufacturing sector. Rising global tension and conflicting inter-country relationships have led to growth in demand for defense and military aircrafts driving consumption for composite adhesives. Two-part structural adhesives industry size from automotive joinery application will generate revenues surpassing USD 1 billion by 2024. Strict regulatory regimes in Europe and North America pertaining to emission control and improving fuel efficiency essentially replaces fasteners with sealants driving product demand. Germany automotive industry accounts over 30% of global passenger car production and produced over 15 million vehicles in 2015. Germany polyurethane structural adhesives market size should witness gains at over 3% during projected period. This growth in regional demand can be attributed to its prevalent automotive manufacturing and OEM industry. Germany holds the status of being major automotive manufacturer producing over 5 million passenger cars and over 325,000 trucks and buses. Stringent regional regulatory regimes regarding emission & VOC control along with strong R&D investments surpassing USD 24 billion should propel regional product demand. China acrylic composite adhesives market size should grow significantly at over 7% by 2024. Strong application scope for acrylic based structural adhesives in marine, aerospace and construction industry should drive regional product demand. China construction industry grows at a massive rate of over 17% owing to increasing population and strong infrastructural growth owing to increase in construction for bridges, dams, airports and roads driving regional product demand. Global composite adhesives market share is moderately fragmented with presence of key industry participants including Azom, MasterBond, 3M, Permabond, Henkel, Hexcel, Romeo RIM, LORD Corp, PPI, Parson and SEM. Companies are increasingly investing in R&D to expand their product application portfolio along with advancement in production technology reducing material waste and production cycle & cost. These participants also focus in strategic alliances by mergers, acquisition and partnerships to expand their distribution network and market share in other countries. These strategies also support them to gain competitive advantages which is likely to impact positively on composite adhesives market growth. Composite adhesives typically consist of at least two elements- the matrix and the reinforcement. These elements have different physical and chemical properties individually. But when combined to form one system it imparts unique adhesive properties making them popular in high tech applications requiring high strength and lighter weight. Most commonly adhering substrates for structural adhesives are carbon fiber, metal, glass fiber, Kevlar, plastics, steel and aluminium. Commonly available and widely used structural adhesive are epoxy, polyurethane and acrylic. After its application most of these adhesives require thermal, UV or dual treatment along with application of pressure through jigs and clamps. Two-part structural adhesives offer higher versatility in manufacturing process along with ability of offering high strength. Characteristics of composite adhesive provide high strength, long fatigue life, low thermal expansion, high stiffness, low weight and density.